Replacing Ben Spies at the satellite Yamaha team meant Crutchlow had big shoes to fill, such was Spies’ reputation only three years ago, but the Coventry native has surpassed Spies’ achievements at Tech 3 and will become a factory Ducati rider for 2014. “Three years is a long time for a team and a rider to work together and when Cal joined us it was his first time in MotoGP and in this paddock,” said team manager Herve Poncharal as he looked back on their time together. “He didn’t follow the normal steps of Moto3, Moto2 and then MotoGP, and was coming from World Superbikes so it was a difficult year in 2011 as he had so much to learn about the paddock about a prototype chassis, engine, carbon brakes and Bridgestone tyres. One aspect that has played a key role in Crutchlow’s development was his relationship to Poncharal. The friendship that has developed over the past three years is clear to see and it will be with a heavy heart that their professional partnership comes to a close at the Valencia Grand Prix. 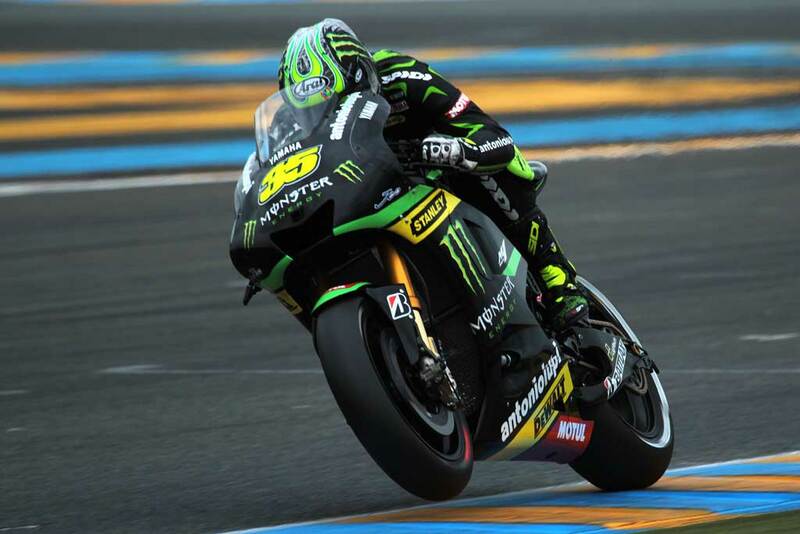 “It’s a big change for me and I didn’t want to leave Tech 3,” said Crutchlow. “This is a fantastic team and I’ve become friends with everyone here and to leave a competitive package like the Yamaha I had to look at everything realistically. “Over the last number of years no satellite team has been able to win [races], Toni [Elias] won in 2006 and Sete [Gibernau] did it before that, but that’s years ago. I don’t believe that it’s down to the riders. Factories win championships and factories win races. “I think that if people look at their jobs and they saw that each year they were getting better if they weren’t getting promoted or someone else came in from a lower position into their job and had a guarantee of getting better stuff I think that most people would feel the same as me,” said Crutchlow. “Some of my old friends told me Moto2 would destroy grand prix racing because outside of 250cc racing there was no way to prepare riders for the top class. The production engine was crazy, so was not being able to work on the gearbox and the lack of power, simple electronics and other things but we brought a really incredible show so it has fulfilled its promise. Even so he gave a good account of himself and adapted well to the class even though some heavy crashes, including Mugello where he badly damaged his left little finger and wrist. Once he asserted his ability once again the former 125cc race winner relaxed into his role as the team’s junior rider and with the light firmly focussed on his team-mate Smith has been able to quietly go about his job and develop towards getting the most from the bike. “Pol is just another rider and we certainly won’t have the same relationship that I have with Cal,” admitted Smith. “It’s going to be nice because Pol is someone that I’ve raced against since 2005 so for our career paths to go side-by-side like they have with relatively similar results is something that excites me. With Marquez having adapted to MotoGP so easily there will clearly be huge pressure on Espargaro but it is hard to imagine having a better team around a rider than the atmosphere at Tech 3. Even so Poncharal warned there is no secret to a rider’s development. “There is no magic to develop a rider; there is hard work and passion. At Yamaha we have four riders, with the factory team having the mission to win races and win the championship. Our position is more as a rookie team to prepare the riders and work with Yamaha to see how they perform and see if they are good enough to work with the factory team. We have seen that with Ben Spies in 2011 and we could have seen it with Cal too. “I think the target for Yamaha is the same for Pol as for Ben; in year one he will be with Tech 3 and then they can see if he is ready and if there is room at the factory team than he might be in the factory team. There is no magic [formula] just like in every job if you work hard and you work well and support your riders there is no reason not to achieve and the best example is Bradley. “I don’t know the level of bike we will have next year but I remember when Colin was with us and Ben signed as factory rider that Ben never had any advantage. Yamaha always gave equal treatment. This entry was posted in Analysis, MotoGP and tagged Bradley Smith, Cal Crutchlow, Crutchlow, Ducati, Grand Prix motorcycle racing, MotoGP, Tech 3, Yamaha. Bookmark the permalink.